I’m so ready for football this season it’s ridiculous. All I have been able to talk about recently is the NFL and college football. Hell I’m so excited I may even watch a poorly played local high school game on TW3. Well, maybe not the last part, but I am over the top ready. My Syracuse Orange, Notre Dame Fighting Irish, Buffalo Bills, and New York Giants watching is going to be in ultra-full effect this year. Apologies to my wife, the poor girl. The Buffalo Bills have made a bad move by not pulling out all the stops to get Paul Posluszny to return to Buffalo. They lost him to Jacksonville who, by the way, is totally revamping their own defense with the Posluszny signing, in addition to bringing in safety Dawan Landry (from Baltimore) and LB Clint Sessions (from the Colts) and the release of former first round pick (2008) DE Derrick Harvey who produced only 8 sacks in three seasons. Seahawks fans have to be ripping their hair out at the Tavaris Jackson signing. Jackson is far from franchise QB material and I highly doubt he will be any sort of improvement over the Hasselbeck/Whitehurst combo, unless between now and the start of the season they upgrade their offensive line, wide receiving corps and running backs (aka their entire offensive unit). Reggie Bush to the Miami Dolphins appears to be a pretty good signing, though I am unsure how the cold weather of division foes Buffalo, New England, and the Jets is going to affect him. I don’t think he is going to be used as a primary back, but more like a do everything receiver, half back, wildcat guy which should help reduce the effect of cold weather on his sometimes brittle body. It appears Vince Young is going to become the backup to Michael Vick in Philly. This tells me all that I need to know about Young. He had opportunities to sign with a team with which he would be the starting QB and he chose a place where he will be the backup with no hope of starting. With this I have officially written him off of having any chance of being an impact player on the NFL level, winning record as a starter or not (he’s 30-17 as a starter). The NFL currently has two of the most pigheaded and ignorant people in all of sports in ‘retired’ QB Carson Palmer and Cincinnati Bengals owner Mike Brown. Ridiculous situation. The New York football Giants reportedly have a deal in place with DE Matthias Kiwanuka and are close with RB Ahmad Bradshaw. The re-signing of Kiwanuka means Giants fans may have seen the last of Osi Umenyiora, who is again threatening to hold out on the basis that he wants more money. If the Kiwanuka signing becomes official and I was the Giants I would tell Osi he can go kick rocks. I believe Jason Pierre-Paul is more than willing to step up to the plate. The Kevin Kolb to Arizona for Dominique Rodgers-Cromartie and a 2012 2nd round selection is an even trade and I like it for both teams. Ten years from now we could look back and hindsight will tell us whether one side ‘won’ or ‘lost’ the trade, but as of right now it’s a great deal for Philly and Arizona. The Cards needed a QB desperately and Philly wanted the most they could get back for him and that they did with a sometimes great, sometimes lacking focus CB in Rodgers-Cromartie and the 2nd round pick. What move did the New Orleans Saints make to try and replace Reggie Bush, a small do everything back? They replaced him with another small, do everything back! Darren Sproles is tiny to say the least, but his impact on his team during the course of a game is roughly the same as Bush. Great signing for the Saints and I’m sure Saints QB Drew Brees is smiling just a bit right now. Plaxico Burress is officially reinstated by the NFL and guess who’s interested in his services? The New York Giants and the Pittsburgh Steelers, his two previous teams with which he left on not the best of terms. Apparently this lockout and short free agency period is causing teams to just lose their damn minds! As to where he will end up, I’m not sure I can make an accurate guess because common sense is telling me it shouldn’t be either. Just a day ago I would have said the Eagles or the Jets. So Nnamdi, where are you playing this year? 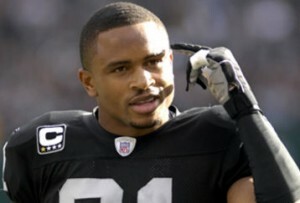 The thought of Nnamdi Asomugha ending up with the Jets is a scary thought. Just imagine a cornerback duo of Darrell Revis & Asomugha. It’s an incredible thought and Rex Ryan is probably drooling over this thought instead of that steak he saw in the grocery store the other day. Update (6:04pm): ESPN’s John Clayton is reporting that the New York Jets are out of the Nnamdi hunt. Cowboys a shoe-in? Update (6:46pm): The Philadelphia Eagles have swooped from (seemingly) out of nowhere to land the services of Nnamdi Asomugha. There will be updates on all moves and news on the NFL through out the rest of the preseason and alllll season long. Come back often!